Custom paint on a John Deere tractor is pretty cool. 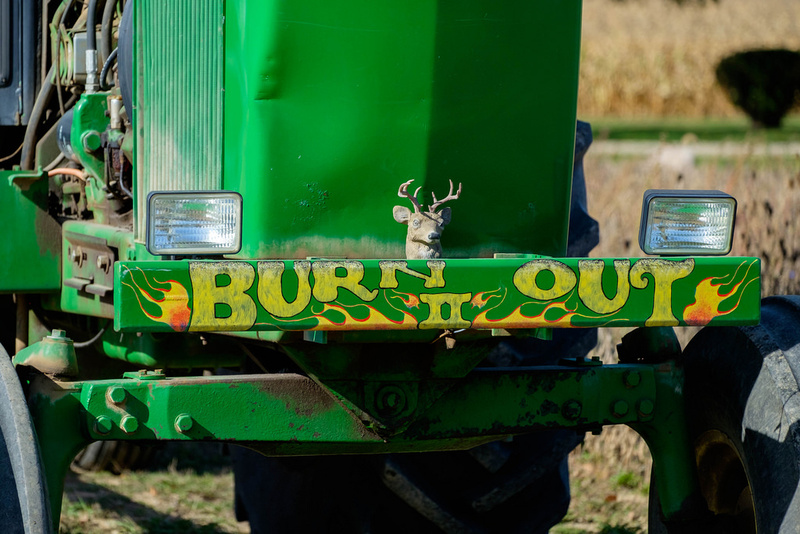 Custom paint on a John Deere tractor with a deer head “hood ornament” is even cooler. I can’t help but wonder what Burn Out I looked like. In the interest of saving money, the old junkmilesmedia.com site is gone, but sort of back in the form of a sub domain to my long time personal site. I enjoyed having a second site that was heavy on photo content and light on my crap writing, fruity language, opinions, and sophomoric humor; you know an attempt to keep “business Jason” and “crap cycling blog Jason” a bit separate. Well, Junk Miles Media never really turned into a business, and that’s not necessarily a bad thing. I’ve done, and will continue to do, some event photography, put together some photo books, and sell what I can, but I realized that I just enjoy taking photos, learning the art of photography and posting them up for people to see. The subjects of my photos include rural Michigan, sporting events, and everything in between. My long time blog The Soiled Chamois started back in 2005 when I was racing mountain bike events and devolved into I don’t know what, and is still fairly cycling heavy. This Junk Miles sub domain will be photo heavy and will thankfully have little to do with me personally, think of it as my Instagram feed on steroids. Yeah, maybe that’s what it is. With all that said, I hope you enjoy the photos.